Kinsmart 1953 Cadillac Series '62 KT5339 1/43 scale Die cast. Road Champs Chevrolet Blazer, Chevrolet Truck Series diecast, 1/43 scale. Road Champs diecast Chevrolet Bel-Air South Dakota patrol car, 1/43 scale. Road Champs Kansas highway patrol vintage ciecast, 1/43 scale. Ford Fairlane 1957 diecast from Road Champs collection. Reader's Digest Collection vintage blue ambulance truck. Reader's Digest Collection vintage Newspaper delivery truck. Handcrafted wooden HORNET race car. Road Champs vintage Ford car diecast from police series. Road Champs diecast 1957 Ford Fairlane Colorado State Patrol car, 1/43 scale. Realtoy (Daron) #RT2364 Northwest die cast metal airplane. 1965 SHELBY COBRA 427 S/C 1/24 by Jada. MIRAGE 2000 die cast plane 2-EA, No 63110 military theme collectible toy. 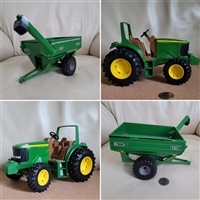 ERTL tractor with grain cart die cast toy, vintage. 1997 KIDDIE CAR HALLMARK and Coca Cola Town Square Collection 1957 Chevy 2 Door. REMCO, Road Champs, dump truck toy 1989. Vintage Spinning top farmhouse toy. Harrods Knightsbridge The Queen Mounted ceremonial figurines, 1988. The Mystery Machine and Scooby Doo mystery solving crew toys. VIntage Fisher Price Molly Betsy cow pull toy, 1972. Large TONKA CHEVRON 24 hours metal service truck toy, 1978. Hand crafted vintage tractor primitive Folk Art cast iron toy with moving wheels shop toll parts incorporation. Campbell Soup huge Fire Truck tethered controlled. DINKY TOYS German plane, Junkers JU 87 B.